The perfect gift for golfers! 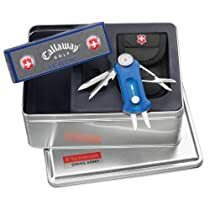 Featuring the famous 10-function GolfTool by Victorinox with one-hand divot repair tool, a Cordura carrying pouch with clip for your golf bag, and 3 Callaway Blue Big Bertha golf balls.Golfers world-wide swear by their GolfTool. It is wide, flat and lies very comfortably in the hand. Ten tools are fitted underneath the robust, scratch-free nylon shell. Every golfer will appreciate the ball marker, repair tool (pitch fork) for one-handed use, the tee puncher, and the groove cleaner. Using the ball marker, which is held in a slot on the top surface of the tool, the position of the ball can be quickly marked on the green with one hand. The repair tool is also very useful because the tool can be extended using the golf ball shaped pushbutton, and can be used to repair depressions in the grass. The blades fitted on the side disappear into the inside of the tool with the slightest pressure, so the fork is very comfortable to use. And, finally, the blade of the groove cleaner can be used to clean the grooves on a golf club, and is very useful for punching the position for the tee – especially in hard or frozen ground.In short, the GolfTool is a must-have for every golfer.